The King Of Midcentury-Modern Design Doesn't Hate "Mad Men"
Flutes of Champagne, hors d'oeuvres, and artisanal popcorn passed around the room, while celebrities and industry insiders like Martha Stewart and Nina Garcia greet each other with smiles. Photogs and onlookers Instagramming their pictures. The music — a mix of top 40s and hip-hop — blares throughout the large NYC space showcasing jcp's newest home collaborations. 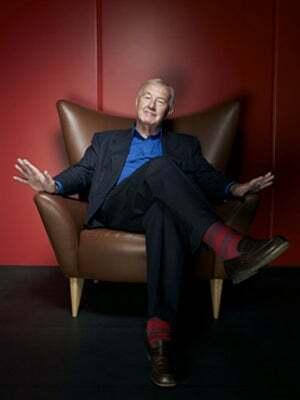 And in the far corner, atop a cobalt-blue, scrolling-arm chair, like a king watching over his subjects, is Terence Conran. Not a king, though, but an actual modern-day knight (he prefers to go by Sir Terence Conran), the 81-year-old designer, restaurateur, and entrepreneur looks tired, but surrounded by a tripod side table, wooden consoles, and other items from his Design by Conran collection for jcp, he is home. Plus, the free-flowing Scotch doesn't hurt. In a way, this is a dream come true. "I've always, since my early days, wanted to design products that were available to anybody," Conran says. When he first started his foray into interiors, only the wealthy could afford his pieces. And, now, after decades in the business, he can bring his midcentury-modern wonders to Americans via jcp for a fraction of the cost of his own designs — and that of contemporaries like Herman Miller. But ever since what seems like the success of AMC's Mad Men, the fashion and decor industry has been overloaded with midcentury-modern trends, perhaps diluting the integrity and foundation of the design aesthetic. Does that bother the MidMo godfather? Not in the least. "What I've been doing for many, many years now has mass-market acceptance," says Conran. "It provides an opportunity for young Americans to pass down quality pieces to their children." You still have to value its purpose and not just its style or trend appeal. The success of his brand has been based on a simple mantra: quality not quantity. "[My designs] are not pretentious or gimmicky. They are plain, simple, and useful," says Conran. It's not just about owning teak tables and Eames chairs for the sake of owning them. Ask yourself why you own them? Really embracing the aesthetic is to collect pieces that are both functional and comfortable. "After a hard day's work, you should be able to breathe easy, have a drink, and relax on a comfortable couch," he says. When shopping, look for "materials that are going to last, look at the construction, look at the fabric" — all these simple things will make the difference between a lifetime investment piece and a broken, stained piece of furniture set out on the sidewalk for trash collection. "In 60 years, I've realized the importance of high-quality design," Conran says. With that much experience, it's advice worth listening to. Photo: Courtesy of Design Museum.